The Jaroslav Ježek Memorial – The Blue Room is found at No. 10 on Kaprova Street in Prague’s Old Town. It was here that this important pianist and composer spent the better part of his short but intensive career. The building is adorned by an inconspicuous bust of Ježek by the sculptor Václav Vokálek. 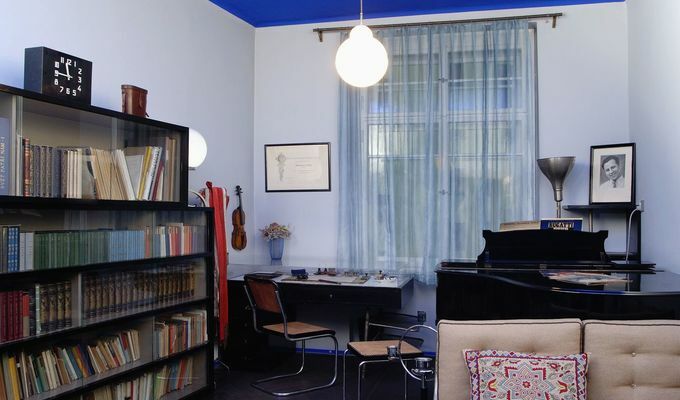 The interior of the ‘Blue Room’ and its contents, coming from the 1930s, have been preserved thanks to Ježek’s mother and later his sister. The modern functionalist furniture was designed by a friend of the composer, the architect František Zelenka, who also designed sets for the Liberated Theatre. The unusual treatment of colour on the walls and ceiling as well as the various sources of lighting created an environment that accommodated the needs of Ježek’s impaired vision. We can see here the piano on which Ježek played. Also distinctive is the rich library, containing many important works from Ježek’s time including, in the musical portion, scores with personal dedications from Igor Stravinsky and Darius Milhaud. Ježek’s artistic orientation is also documented by his partially-preserved collection of phonograph recordings. Important dates from the memorial’s history: 1956 Bust of Ježek unveiled on the building on Kaprova Street. 1983 After the death of the composer’s sister, the memorabilia from his estate are acquired by the Museum of Czech Music (today’s Czech Museum of Music). 1989 The Ježek Memorial opened to the public. Entrance is possible for groups of 3-10 persons. The Monument tour is possible only with a guide.